If you want to comment on the pictures in the 30 Day September Challenge! You can do so here . Unfortunately a have a pile of work in september but I love watching your edits. Gwen, I did a quick colour fix using the gray colour picker in a curves layer. Is this what you were after? For starters, I'm not sure there are much greens in the dry plants. However, it all begins with a perfect scan. I'm using VueScan on a EPSON 2450, RGB 48 bit mode. One can tune the scan from the preview which is a lot easier than to work a mediocre scan in Photoshop. It's also possible to scan to a RAW file which you can process in Lightroom later. 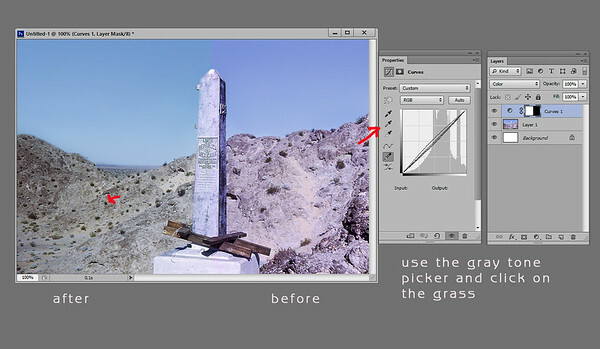 However, if you want to select the plants only, you can use the "Selection" in Photoshop. Select either color range or brightness level, then (with the selection still in effect) create a new color effects layer. Make that layer green and set the blend mode to "color dodge". Now make the color effects layer a group, add a layer mask and paint away all the color selections you don't want with the brush. Sounds complicated, but it's done in less than a minute. I'm so glas so many decided to join our little challenge! I love watching your edits every day and you photos are all so lovely! Here's to making it all the way to the end of the month . I'm cheering for all of us! Just a little FYI though, I am dealing with some health related issues right now, and therefore, even though I really, really want to, I don't know if I'll have the energy to comment on all of your photos. But I shall do my best to comment as often as I can. I always love your texturizing! This is no exception. It's like half a painting half a photo and what a lovely subject. A lot of mood in this shot too. Well done! Cool! I like the texture created by the light, at some places it reminds me of the look of painted hair in some of the illustration contests here at the Bay. it's gonna be fun to see what you can do with the technique this month. What a great start to your challenge! Sharp and crisp with action at the right places. It looks so cool with them flying upside down like that, or have you simply flipped the picture ;) ? Wow, truly a hero! No one should have to go through something like that and especially not a child. He looks like a great kid. Great picture, I really like the composition with the lighthouse in the back. Cool an other batch or retro stuff, I love it . Hmmm... about getting the grass greener, I agree with secretatlantis. If you're working in photoshop I can also recommend a free plugin called the Nik Collection, it has some really great filters to help you tweak you photos and save a lot of time. I use it a lot. In the option "color effects pro" there is a "foliage" filter. Maybe if you do the thing sectretatlantis wrote about first, and then go to there, you can get it even greener. Great that you decided to join! Nice first shot. Mr and I drove through Germany just this summer and this shot really captures the mood of the german small town . Just to say its nice to see some familiar names on here, and I look forward to seeing what you come up with! I have only Photoshop Elements 8 and the scans were done in about 2006 on my old printer. I haven't looked recently to see if I can find something to rescan the slides, but up until a year or 2 ago there were no longer any options for that. Still, I think I can make use of your suggestions, and I really appreciate them! All the best to get the job done! MrsHjort - Your photos are so beautiful, and then you make them even more beautiful. Impressive. Defyaugury - Your pictures aren't "realistic" in the way I usually prefer, but they are very artistic and interesting. MadamMtnLion - I'm loving the light blading. Very different and beautiful. C-Max - I'll never get tired of the excellent airplane photos. That one of them all jammed together was scary looking. I couldn't convince my husband it wasn't a crash. pietopper - Always enjoy the beautiful flowers. Hope you can continue this time. And thanks for the IDs. Craig_r - Great photos. That cat is much more interesting than a conventional pose, and your boys are so cute. Funny faces just add to the personality. LetItBeFun - Always enjoy your very professional photos. essjaynz - My favorite photos show things I have never seen before. Love yours, especially that slanted street which is really different and interesting. Hi All. So good to see so many people partaking this year and off to a great start too. Already I'm enjoying what I'm seeing a lot, from Mrs H's epic architectural visual feasts, Defyaugury's unique and original processing, MadamM's new age modern paintings, Piet's fine floral photos and Craig's honest, endearing family collection to Gwens' excellent restoration efforts, LIBF's entertaining daily observations and essjaynz' awesome holiday adventure shots. Looking forward to seeing more as the month progresses. MadamMtnLion - thanks for posting - that's an impressive array of props - I look forward to seeing what you do with them!